At C&B Equipment our team is committed to safety in every way possible. One way we are furthering our ability to maintain safe conditions for our customers and employees is through complying with Department of Transportation (DOT) certification regulations. C&B currently has three trucks and trailers certified. C&B currently has three trucks and trailers DOT certified. 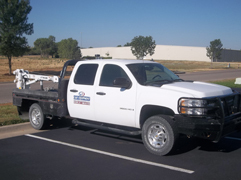 Our goal is to have our entire fleet compliant with DOT certification regulations by the end of 2015. Making sure extinguishers are equipped and functioning properly on DOT vehicles. Conducting annual physicals on all our drivers. Performing random drug and alcohol tests on all of our drivers. Ensuring all drivers are carrying medical cards and properly tracking their logs. Complying with DOT certification regulations is just one of many ways C&B Equipment can uphold our promise of providing real solutioneering and the best safety measures possible.